"No American is above the law"
Mr. Speaker: I come before this body today as a proud American and as a servant of the American people, sworn to uphold the Constitution of the United States. No American is above the law, and if we allow a President to violate, at the most basic and fundamental level, the trust of the people and then continue to govern, without a process for holding him accountable —what does that say about our commitment to the truth? To the Constitution? To our democracy? Leading up to our invasion of Iraq, the American people supported this Administration’s actions because they believed in our President. They believed he was acting in good faith. They believed that American laws and American values would be respected. That in the weightiness of everything being considered, two values were rock solid —trust and truth. President Bush, along with Vice President Cheney and then-National Security Advisor Rice, portrayed to the Congress and to the American people that Iraq represented an imminent threat, culminating with President Bush’s claim that Iraq was six months away from developing a nuclear weapon. Having used false fear to buy consent—the President then took our country to war. This has grave consequences for the health of our democracy, for our standing with our allies, and most of all, for the lives of our men and women in the military and their families—who have been asked to make sacrifices—including the ultimate sacrifice—to keep us safe. I am not willing to put any political party before my principles.This, instead, is about beginning the long road back to regaining the high standards of truth and democracy upon which our great country was founded. Mr. Speaker: Under the standards set by the United States Constitution, President Bush—along with Vice President Cheney, and Secretary of State Rice— should be subject to the process of impeachment, and I have filed H. Res. _ in the House of Representatives. To my fellow Americans, as I leave this Congress, it is in your hands— to hold your representatives accountable, and to show those with the courage to stand for what is right, that they do not stand alone. The Iraq Study Group (sounds like a bible study class or something - which might be a good name because you have to have alot of "faith" to believe in their conclusions) today released their recommendations to the nation on how Bush should proceed on Iraq. 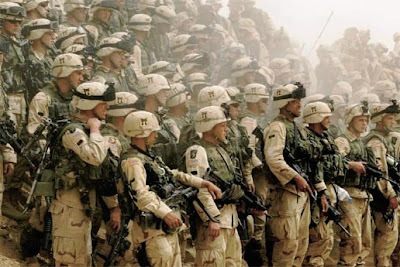 The Democrats in Congress held a secret meeting yesterday in Washington to figure out their position on Iraq. Nancy Pelosi, the Democratic Speaker-designate and a frequent critic of George W. Bush, announced the forum to flush out fresh ideas. Afterward, she said: "What we heard today is that there are no easy answers in Iraq." It’s the Vietnam-era domino theory making a comeback. Gates is invoking the fear that if the U.S. leaves, the region will be taken over by terrorists and other bad guys like Syria and Iran. So we are now seeing the justification shifting to a new excuse for keeping the occupation alive. Do you notice the similarity between the words from Gates and Reyes? The administration’s talking points are making the rounds and are being picked up by the Democrats as well as the Republicans. Who said the Democrats are the opposition party? Rep. Reyes is also calling for more troops in Iraq, from 20,000 – 30,000, so the U.S. can “dismantle the militias.” Isn’t it interesting that Nancy Pelosi appoints a guy to head the Intelligence Committee that wants more troops in Iraq and wants to expand the fighting? Do you think she didn’t know his thinking on Iraq? I was at a meeting last night and learned that a friend's son, who was in Iraq for a year with the Army, is being called back to active duty. Their son had been discharged over a year ago and has been attending the University of Maine. He is now being made to go back into the Army and will probably be sent back to Iraq. That is a draft. His parents, who severely suffered during his whole time in Iraq, are devastated at the thought. Don’t think for a moment that this occupation is going to end anytime soon. The U.S. government is now playing with our heads and setting in motion the shell-game to keep this thing going for a long, long time. 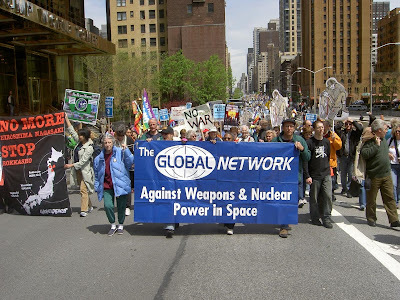 The Global Network will hold its 15th annual international membership meeting and conference in Darmstadt, Germany, on March 23-24, 2007. The theme of the conference will be: The Role of the European Union in the Militarization of Space. Darmstadt, located close to Frankfurt am Main, hosts two major European and one US space facilities: the European Space Operation Centre (ESOC), which plans and conducts satellite operations for the European Space Agency; the European Organization for the Exploitation of Meteorological Satellites (EUMETSAT), which delivers weather and climate-related satellite data and images; and on the outskirts of the town a US spy station, which is part of the global Echelon surveillance system. 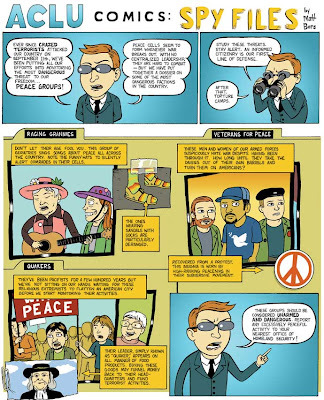 Click on the cartoon to enlarge it so you can read it. You gotta laugh or you go nuts these days. In the end one key reason I think they infiltrate groups is in order to create fear in the mind's of the public. The hidden message is - "Hey you don't want to associate with these people! If you do you will get on a list and like in the old Soviet Union you will find it harder to get a job if you have been identified as a dissident! So keep your nose clean. Don't rock the boat. You can't beat city hall anyway." This way the power structure can help to limit the growth of the opposition movements. They obviously also expose themselves as the public ultimately learns that the government does not believe in true democracy.